We are happy to improve Quotescover and keep it available free for everyone, But If you insist to treat us a coffee or snack,.. well here is the donate button :). Thankyou. View Future Development Plans | Contact us . New Quotes Maker is Here! Read me! This version still have limited graphic processing capability compared to our flash version quote maker. But this change is a necessary step since Flash is no longer supported by modern browsers. 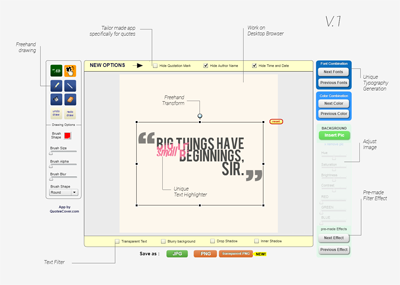 This is a good foundation to make a better futureproof Quote maker and online simple graphic editor. We have a plan to improve this app like you see on the list below, but your suggestion is more important to keep it on the right track. So please kindly contact me if you find an error or want to suggest new feature . Now you can change font type. We have around 550 fonts so we devide it based on its visual appearance and you can play with "change font" widget to shuffle the font with the same type. We dont use Google Font anymore. Now we use font from previous QuotesCover. This big change will enable us to freely create more custom font and also make it much much faster to load. Text color changer. Use native color picker. User can switch between canvas size without breaking design. Make the style consistent in all dimension. Unlimited text on both quotes text and author text. This give you more flexibility not just for quotation picture. Pexel photo is now integrated by default. Save you much time. Bring unique graphic editing of the old app to this new app.